I found this on a Virgin records Radio Promo disc from July 1990. 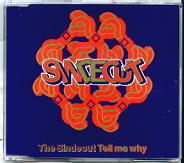 After 7's 'Cant Stop', Bass-O-Matic's 'Fascinating Rhythm', Steve Winwood's 'One And Only Man', or McSkat Kat's "Skat Strut' could have taken first spot on the disc, yet english hip-hoppers The Sindecut made the grade. Track one on a labels promo CD is considered the heatseeker back then by PDs. Nowadays, its the labels recommended 'safest hit'. So sad it never went anywhere in NZ at the time. Probably because 'Suicide Blonde' and 'U Cant Touch This' were dominating the Hot 9 at 9. Crazy Noddy and Fingers are good friends with UK producer Insane MacBeth who is one of the UK's first generation old skoolers (influenced by pirate radio DJ Westwood and Deckmasters - the DJs behind Cookie Crew), and aided them between '86 until they were signed.